The team at Search Group in Perth, are experienced within the online marketing space, and like to keep at the cutting edge of ‘martech’ (Marketing Technology) advancements, in design, strategy, development, apps and social media to ensure that we bring our business clients the latest and most effective means to market and advertise their brand to today’s audience on the channels where this audience resides. Search Group are a HootSuite Solution Specialist Agency, for social media management, and can setup, optimise and train client accounts on this popular social media application. Our Perth based social media experts are here to assist your business, and your staff, gain benefits from using social media marketing. Recommendations from friends and family on Facebook have been shown to influence 72% of online shoppers in their buying decisions. Key Influencers and social media Brand Ambassadors can amplify your content marketing, increasing reach and visibility for your content. Social media can provide support to traditional sales methods through reinforcement of brand and offers, whilst also connecting consumers to the online community for trust signals through reviews, feedback and product experience stories. Search Group manages both the organic and paid advertising management process for your business, setting up the social media channel account, optimising the social media profile, creating social media marketing strategy and content plans, establishing the social media channel Ad account, creating Ad Groups, designing the Ad creatives, carefully selecting targeting options based on demographic profiling matching your intended audience persona, setting the target location, managing bid amounts and campaign optimisation with effective A/B multivariate testing, configuring the social media tracking pixel for conversion tracking through to your website so that we can measure the effective Return On Investment (ROI) of your social media campaigns. Social media business page advertising can be done for a range of content depending on the particular channel options. Search Group can also assist your business with not only the content creation and strategy, but also the social media channel monitoring, brand alerts and managing your various social media pages for your business. Search Group provide individual and team training in all the major social media channels. We run workshops with businesses to create social media policies, procedures and customer persona profiles. Our experience with corporate brand crisis management and reputation management, provides solutions tailored to your business. We also work with key influencers and bloggers for content marketing solutions. 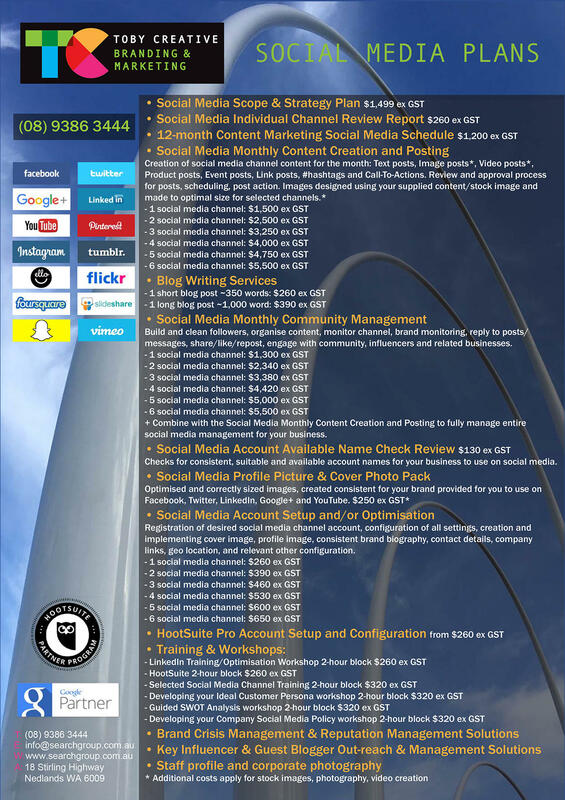 Download or print-out, our Search Group Social Media brochure, then either call us on (08) 9386 3444 to book a no obligation free initial consultation at your location so that we can discuss your specific requirements, or fill in our contact form on this page to send us your details and we’ll contact you back. Ask for our FREE website SEO report to find out the current status of your website and which areas can be improved. Connect and follow Perth social media marketing Company Toby Creative on any of our various social media channels. See how we handle our own social media management process.